Unless you’ve been living under a rock for the past several months, you’re probably aware that the U.S. dollar is doing quite well. This has caused overseas property buyers to spring into action, seeking currency bargains in places like Colombia, Chile, Europe, and Mexico. But what you may not aware of is that the Canadian dollar is struggling… not only to keep up with its southern counterpart, but to even stay afloat in relation to other currencies around the world. The U.S. Dollar Index, which measures the U.S. dollar versus other major global currencies (the euro, Japanese yen, U.K. pound sterling, Canadian dollar, Swedish krona, and Swiss franc, in order of weighting in the index) has shot up about 20% in the past 12 months, reaching a height not seen in more than 10 years. Against other select currencies, such as the Colombian peso, the U.S. dollar has gained more than 50% in that time. Obviously, this is great news for U.S. dollar holders. Meanwhile, in the past 12 months, the Canadian dollar has dropped against the U.S. dollar to an 11-year low, with US$1 now worth about CAN$1.33. That’s an almost 25% gain for U.S. dollar holders since one year ago. 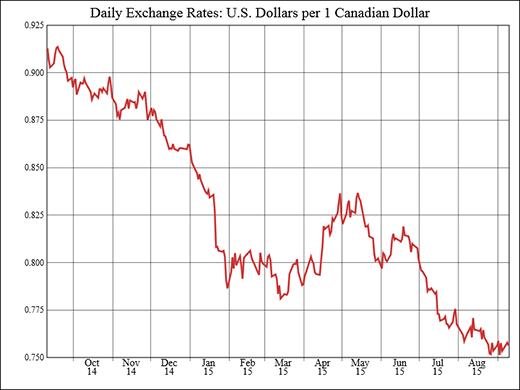 The U.S. dollar’s gain against the Canadian dollar is more dramatic than its gain against the Dollar Index. 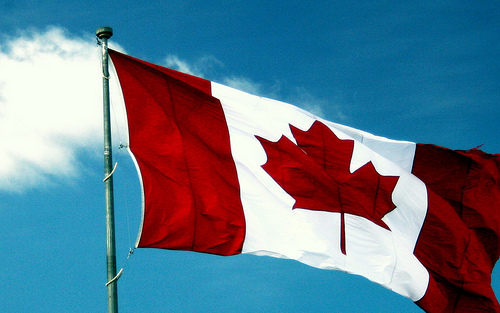 While the United States shows signs of a steady economic recovery, the Canadian economy has been struggling. Two straight quarters of declining GDP, rising unemployment, and mounting consumer debt has economists using that ugly R-word again: Recession. Of course, with a federal election only a month away, the current government is stuck in denial, refusing to recognize the recession as such. But there’s no escaping the fact that Canada’s economy is in the rough. Also, the Canadian dollar is a petrodollar, largely reliant on the country’s tar-sand oil patch in the western province of Alberta. This means that the recent US$40 a barrel oil prices have not been a good thing for the Canadian dollar. What Does This Mean For U.S. Investors? Which Markets Should Be Given Attention By Investors? Be wary about where in Canada you decide to invest. Like any large country, markets vary from region to region, city to city, and neighborhood to neighborhood. While property around the slumping tar-sand oil patch in Alberta—as well as across the other Prairie Provinces of Manitoba and Saskatchewan—is a decent bargain right now, prices in the big cities of Toronto and Vancouver continue to climb. These are not where you’d come to seek a bargain. In fact, Vancouver’s housing market is commonly regarded as one of the most unaffordable in the world, close to that of Hong Kong, and million-dollar fixer-uppers are not unheard of in Toronto. Outside of these markets, a soft easing of prices is already taking place in places most vulnerable to Canada’s current recession. According to the Teranet-National Bank house price index, prices in Calgary, Alberta, which is home to many headquarters for oil companies, have seen a 1.9% drop in the month of July alone and 2.3% in the past year. The Canadian Real Estate Association tells us that both Alberta and Saskatchewan have seen their average prices fall flat in the past year, with almost zero or negative growth. Saskatchewan’s capital, Regina, has taken the brunt of this, with a 5.3% drop from July 2014 to July 2015. This is where you should focus your attention for an income property right now. In these softer markets you can combine the current exchange rate advantage with the “soft market” advantage created by low oil prices. To put into perspective what the strong U.S. dollar means for investors in Canadian real estate, the following are some property samples from Calgary and Regina, two of Canada’s softest markets at the moment, with the current price in both Canadian and U.S. dollars as well as what that price would have been one year ago. This 506-square-foot (47-square-meter), one-bedroom, one-bathroom condo in Calgary’s highly sought after and historical Bridgeland neighborhood is perfect for a revenue property. The inner-city location of this trendy neighborhood with its cafes and shops makes it attractive to young professionals as well as university students, yet the neighborhood’s residential and natural environment (with a river and many parks) makes it a quiet option for a family as well. The unit offers 9-foot ceilings, a gas fireplace, balcony, in-suite washer and dryer, gallery-style kitchen, and oak cabinets. Another excellent opportunity for earning revenue, this property in Forest Heights, an eastside suburb of Calgary, comes with an additional suite in the basement. In total, the house has 1,000 square feet (93 square meters) of living space, with three bedrooms and two-and-a-half bathrooms. The property is close to schools, shopping, and public transit. The home itself has an attached carport, hardwood flooring on the main floor, and new roofing, siding, and windows. In Regina, like anywhere, location is key. This 1,300-square-foot (120-square-meter), three-bedroom, two-and-a-half bathroom property is steps away from Wascana Park, a 2,300-acre park built around a lake. The park is one of the city’s main attractions, with the provincial legislature on its grounds, several museums and galleries, university facilities, a tennis club, and more. The sellers have owned the home for years, meaning it’s in tip-top shape. A new furnace was installed in 2008, and shingles replaced this year. The home also has an attached garage and a spacious and green yard. The basement offers good potential to be renovated with a separate suite, adding additional revenue potential. Located close to downtown and other amenities, this 760-square-foot (71-square-meter), three-bedroom, three-bathroom home is priced low, but the value is high. The basement is only partially developed, which helps with the bargain price, but it wouldn’t take much to finish. The home is graced with plenty of natural light, and the back and front yards have been newly landscaped. A detached garage, shingles, and high-efficiency furnace are some of the other recent upgrades to this home. As for Canadian dollar holders? It should go without saying that purchasing U.S. real estate or any other U.S. dollar investment might not be a good idea right now. Furthermore, for Canadian dollar holders looking to invest outside of Canada or the United States, stay clear of markets that use the U.S. dollar or are pegged to it. Panama and Ecuador both use the U.S. dollar as their currency, meaning your Canadian dollar is just as weak in those countries as it is in the United States. Belize, which pegs its dollar to the U.S. dollar, is also somewhere where your Canadian dollar is as weak. Even the down and out euro, unrelated to the U.S. dollar, is outperforming the Canadian dollar. Instead, look to places like Colombia or Mexico, where the Canadian dollar has managed to keep itself afloat or even gain a few points in the past 12 months. In Colombia, for example, the Canadian dollar has gained about 30% over the peso, which may not be as impressive as the U.S. gain, but is impressive nonetheless. If you are set to move to Panama, Ecuador, Belize, or anywhere else your Canadian dollar has seen some serious depreciation, just rent until the exchange becomes more favorable for a purchase. Changing plans simply because the exchange rate isn’t in your favor is shortsighted; exchange rates change and could move in your favor down the road. Currency exchange rates can be tough to predict, but that doesn’t mean you shouldn’t pay attention to them. Knowing how to react to these types of fluctuations can reward you with a serious boost to your offshore investment returns. Editor’s note: Matt Chilliak hails from Saskatoon, Canada, and has an honours degree in political studies from the University of Saskatchewan, with minors in economics and Spanish. He also holds certification from Fine Art Bartending School. He has traveled throughout Latin America, to Mexico, the Dominican Republic, Cuba, Colombia, and Panama. First of all, Nicaragua. It’s like that old campaign line… “Jack Kennedy was a friend of mine, and sir, you are no Jack Kennedy.” Well, I’ve been in Nicaragua, and sir, Nicaragua is NOT a nice place. The people are sweet, the authority are goons. Anyway Lee, my question: I’ve got six more years before I hang it up, and I want a country with good market for renovating properties and playing some golf. I had to poll our entire staff to answer Dave’s question about golf, which is generally not very popular in Latin America. Our consensus is that the Algarve area of Portugal is the best place for golf, among the 21 countries we routinely cover. And it’s also a good place for renovating a property. In fact, our publisher Kathleen Peddicord and her husband, real estate guru Lief Simon, just purchased a property to renovate in Lagos. As to Dave’s quote about Jack Kennedy, that came from the vice-presidential debate in 1988. It was spoken by Senator Lloyd Bentsen, and directed at Senator Dan Quayle. Thank you for sharing your insights on Latin America. Since your next event is in Nicaragua, and given the recent articles about this country, I have done some research trying to find out if an American can become a citizen and receive a passport there. So far I haven’t been able to determine if you can, and I wondered if you knew whether that is possible. I you ever want to understand why one should never obtain residency requirements via Google, just try looking for citizenship in Nicaragua. You’ll see at least three conflicting sets of requirements on the first page. But yes, it is possible for holders of a permanent residency visa in Nicaragua to apply for Nicaraguan citizenship. The problem for most however, is that you have to renounce any former citizenships you have. In fact, according to Nicaraguan regulations for naturalization, you have to present a notarized copy of your renunciation at the time you apply. The only exception to this requirement is for applicants who are citizens of Central America or Spain. But, remember, as a permanent resident of Nicaragua, you’ll have almost all the rights of a citizen there, except for voting… and the passport. Thanks for these tips on fixer-uppers abroad! They’re good in whatever country you’re in.